After barely an hour of sleep, I saw the light come on in my daughters’ bathroom. I tucked her back into bed, but only another hour passed before the light came on again. I cleaned her up, grabbed my pillow and held her hand as I walked down the hallway to our guest room and we climbed into bed together. Throughout the long and wakeful night, I thought about the trip I had planned this week. I am speaking at a conference tomorrow, and I planned to leave early this afternoon, settle in, meet some friends, prepare for my session, and enjoy the beautiful hotel. Not only that, I planned to stay beyond my presentation to work from the hotel, meet some business contacts, and connect with other friends. I wanted to stay through the end of the conference to hear Whitney Johnson, a long time client and mentor to me, present the closing keynote. This trip would have equaled two full days away from my family, two nights away: certainly not an unreasonable amount of time under usual circumstances. But a child with the stomach flu is not usual circumstances, and I am making plans to shorten my trip, to leave later, to drive to the conference, to speak, and to return home as quickly as I can. 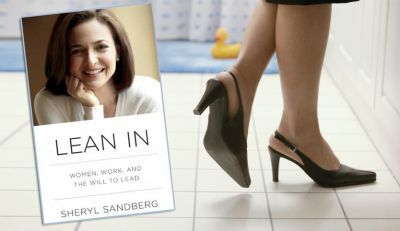 I have not read Sheryl Sandberg’s book Lean In, yet. My copy will likely arrive from Amazon this afternoon. I’ll tell you now, I am predisposed to push back against her message. While I am an ambitious woman, with dreams that I am moving toward daily, I choose to lean in to my family first. I am the only mother my three daughters have. I want them to understand that they are far more important to me than success or earning potential, that being present with them means more than growth in my business or meeting my financial goals for the first quarter. My eight year old, flush with fever, needs ME far more than she needs me to be successful in my career. She needs me to lean in to being with her: to clear my calendar so that I can sit nearby while she rests, so I can bring her water and snacks when she’s ready to eat. I’m leaning into my role as a mother, a role that is primary for me in these years while my daughters are young. I chose to become a mother; I choose to put my role as a mother above my role as a business owner. I’m leaning in to my most important priorities, these precious girls, these precious gifts. I LOVE this post and SO relate to what you write and how you feel, Becky!! I’m so grateful we’re on this journey together of balancing motherhood and career. It’s not easy, and there’s not an exact science. We need to rely on our guts, our faith and our maternal instincts. I think if we lean into those, all will end up as it should. Thanks for writing this and reminding me that I have a dear friend walking right next to me!!! And, I hope your little one feels better ASAP!! We went through the exact same thing a week ago. Thanks, Erin. These are hard choices — and our faith can certainly help us on our journey. I pray for wisdom every day and for grace to choose the right thing in each moment. Awesome, setting the best example for them that you can! I struggle with some of the same things from a ‘Dad’ perspective as it relates to building a business with a 2 yr. old running around. Hope she feels better soon! Safe travels to the conference, you’re going to rock it! As women, we live our lives out through many different roles – whether as wife, mother, daughter, sister, aunt, friend and/or professional. I also believe that as we move through the different seasons of our life, circumstances and/or choice may cause us to lean into one role more heavily than another. While I haven’t yet read Cheryl Sandberg’s book, I have been surprised by the strong response, both in favor and against the concept of ‘leaning in’. My own definition of leaning in? Courageously stepping into the totality of who each of us most authentically are, living lives that are in alignment w/ our highest values and our deepest callings. For some, ‘leaning in’ may be finding the courage to start-over or give life to a voice or dream for the very first time; for others, it may mean choosing to invest in the needs of family above other priorities and dreams; and yes, there are others, too, for whom ‘leaning in’ may well mean stepping into new challenges and opportunities to lead within their careers. Regardless of definition, what seems most important is learning to support each other in our own choices and journeys, however different they may be from our own. Becky, you are amazing and so right. You have your priorities in place. As someone who has had to balance work, family, friends I always tried to make my family a priority. One of my axioms is Family First. It is hard to follow that at times but made every effort. My wife who also was very busy and successful also did so and in fact sacrificed more or her successful career than I. Love your post and blessings to you and your family. They are blessed to have you. Thank you so much! I try to model Family First for my team by making family a priority. I am glad to hear you share about the work you’ve done to put your family first. Glad to be connected to you! Becky – Thank you for this post. I particularly love the simplicity with which you convey your major point. “I am the only Mother my 3 daughters have”. It is a powerful comment. I too am an ambitious woman and have achieved much success in my career. I chose though to alter my career in order to have more time to spend with my 3 children. Looking after them is the hardest job I have ever done, but I know that I will never regret making the choice to prioritise them. I would though like the corporate world to be a place in the future where these sorts of decisions are not necessary and that organisations will adapt to a culture which allows flexibility and different approaches so that combining a family life and high flying career to a level which is satisfying on both fronts is more possible. I have not read the book as yet either. But it is a vitally important message that we choose what we are going to lean into. As women we wear many hats. And yes, while those who have a significant other at home can split some of their duties, occasionally you have to choose your family above the other “stuff” that pulls you away from them. Life, ours and theirs, hinges on our daily choices. So we must decide over and over again what is important and why. We only have few windows of opportunity to get it right with them. And getting it right doesn’t involve lavish trips and gifts, although they appreciate those. Getting it right in things of love and nurturing involve a million little things. Thank you Becky for this blog post. I have spent the last 25 years as a working mom. There are always tough, but rewarding choices and opportunities for working moms! You are doing a great job! While I have yet to read “Lean In” I did hear the author on NPR. And after reading your post here, I wonder if what you are doing is more closely related to what she is talking about…? You are in control of your own career, your own work…you are making the changes you need as a woman and a mother to be there for your family first…however, you are still looking at your work as an important part of who you are. Hope your daughter is feeling better! Love this post! It’s hard to split attention between work and kids and to know when to say no to one and yes to the other. There are right times for each. My kids need to learn I have other responsibilities and my work needs to understand that I’m a Mom first. I know how hard you have worked to get this balance right. Nicely written.